Where to begin!!! I love the pig lips, so funny. The hearts on the umbrella are such a clever use of the stamps. Everything is gorgeous, love your colors. I love that so many sets interact with another!! Beautiful cards!! Beautiful!! Love how you used the rose set especially! the roses are wonderful! WOW! I have to say - you are always showcasing my sets so beautifully - and the upside down umbrella with the heart rain is just so clever! Love it! WOW! Wonderful cards, Melanie! 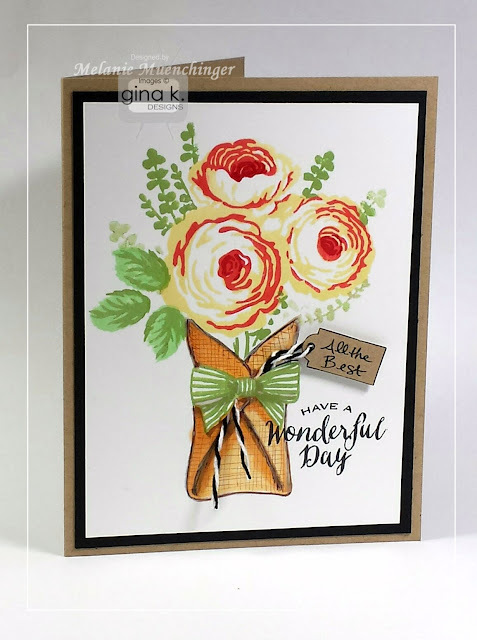 Love how you used the burlap texture on the flower wrap! These pig cards made me chuckle. The pig in the umbrella is too cute! Love the roses and flowers. 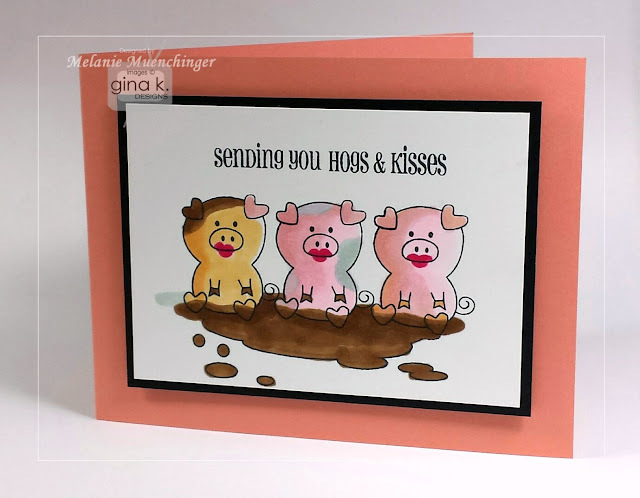 The piggys in the mud are just too cute! The feathers stole my heart this round. Beautiful work and the sentiments in that set are just beautiful! Wow, Melanie, your cards are great, as usual. 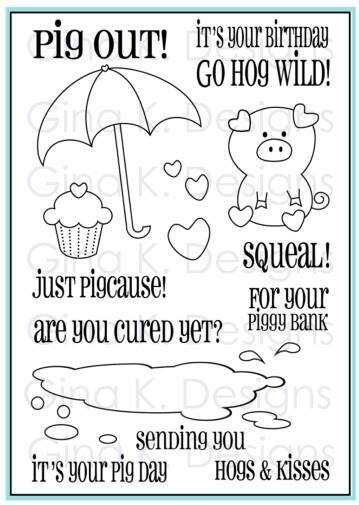 My favorite is the pig sitting in the umbrella, but the pig lips crack me up, too. Another one I really, really like is the feather card. Just beautiful. Thanks for sharing. Melanie, I laughed to hard over "lipstick on a pig" my husband came in my craft room to see what was so funny! Your creativity is amazing. All the cards are inspiring, as always. 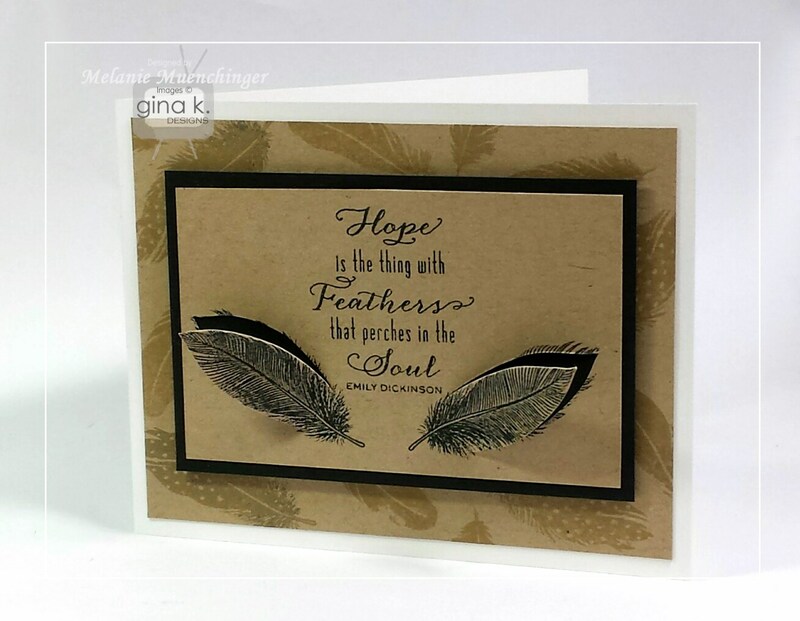 Love the feathers and sentiments - beautiful cards! Loved how you kept incorporating several stamp sets, especially the last one with two of the Tiny Textures and feathers. WOW. Super beautiful - love the monochromatic and the PIG! Ok, where do I start! 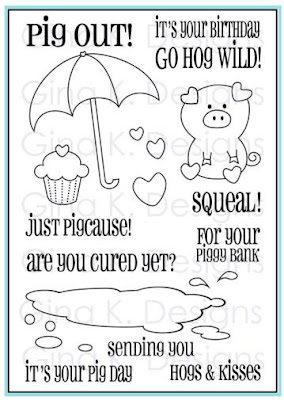 LOL I love the three little pigs, and then the way you used the hearts for raindrops and then as a pattern on the umbrella. 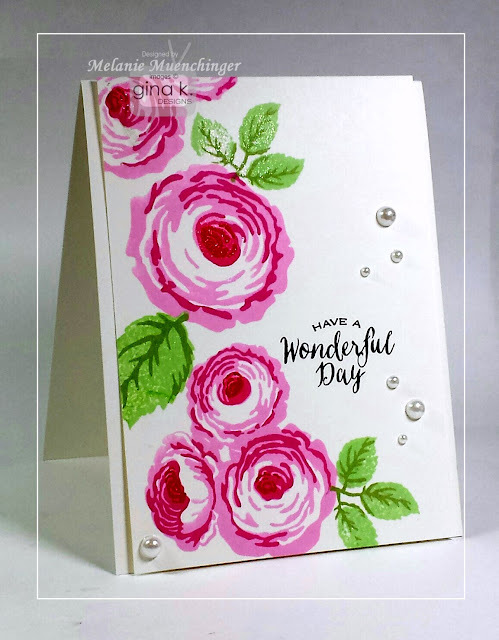 Love the flower cards and both of your feather cards are wonderful! <3 :) Thanks for inspiring! What wonderful cards and I am loving all the new sets. And, your designs using them are super! Melanie, your cards are just beautiful! They all are my fav...thanks for inspiring me! So beautiful! 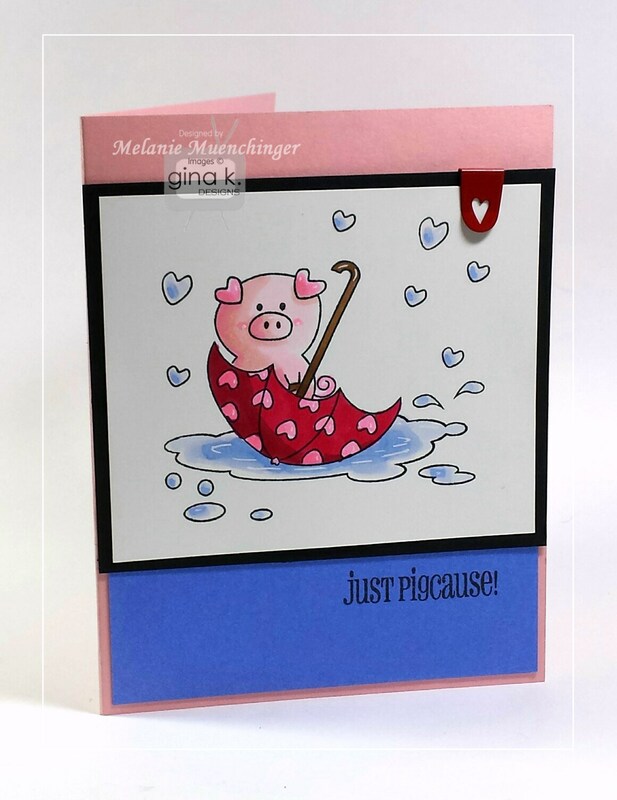 I especially love the pig in the umbrella, cute! Your first card made me laugh. That is adorable. All of the cards are great. Your cards are great! Sophie is so sweet and adorable! Thanks for sharing! I love your cards. Especially the hogs and kisses. Your techniques are wonderful and the colors work so well together. Thanks for sharing your talent. So cute, so beautiful, so awesome! And I could keep going! You are amazing with your ideas and inspiration. Thanks for sharing with us. Oh gosh! I have come to rely on you, Melanie, to show something different. I just love the popping feathers! They're all great! Thank you for sharing! Melanie, you always have a special twist to your designs. Just amazing! Absolutely LOVE the girls with all their lippy on! LOVE that you made the wee umbrella all 'hearty'. The Roses are stunning, especially love the pink blooms and the feathers are just superb! Thank you Melanie! More great cards. I love your work. I love your cards, especially the little piggy cards. So cute. Hi Melanie, Your three little pigs card is just stinkin' cute. The country roses in your wrap with eucalyptus sprigs is beautiful. Thank your for your wonderful designs and inspiration. Adorable piggies and then totally beautiful roses and flowers. Thank you. Super cards. I LOVE how you created the burlap effect with the brown pen. Your eucalyptus leaves look great behind the roses. the shading on the little piggies is so pretty. Love the bright, bold flowers. The feathers look so realistic. Your cards are fabulous. Don't think I could pick a favorite. Looking forward to my stamps getting here. Your cards are awesome. Love those piggies! Your cards are always wonderful. The pig cards are killing it tonight - but I do have to say that your card with the feathers and all the cute stamped smashes in the background - beautiful! I love the pig cards! Who would have thought there were so many ways to use feathers. Inspirational. The pig cards are so cute! Such cute and beautiful cards! 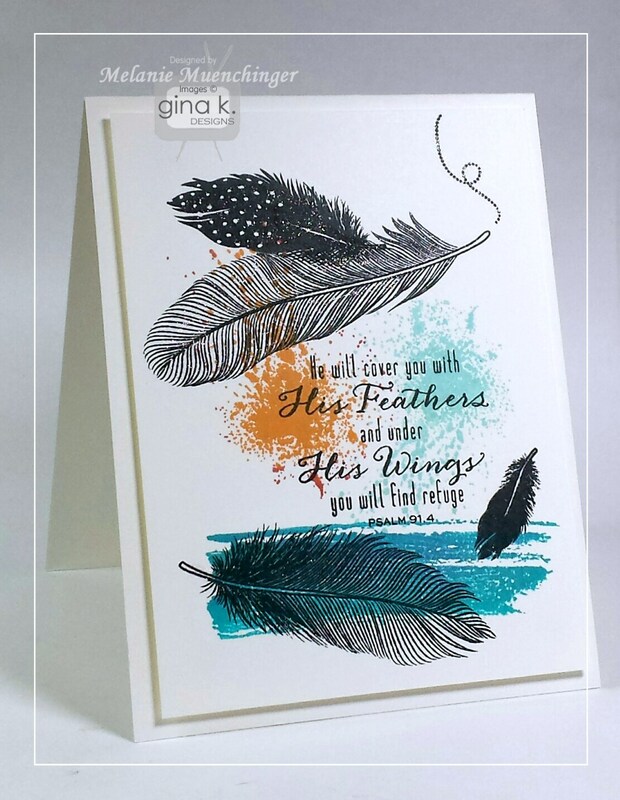 When I first saw "Fine Feathers," I couldn't imagine what kind of cards could be created. Well, I am so inspired by what you and the team have done! Just have to have this set. Melanie: Thank you for even more card designs. I sure do wish that I could come up with some of these ideas on my own, but in the meantime I will be happy to CASE what you and the other Design Team members do. I really like nearly everything that you do, and I so appreciate the little tips that you give like the numbers of the SN markers, or cutting the card above and below the bow in order to be able to insert the baker's twine. Love all the pretty cards you have created. Looks like you had great fun with the little piggy and the roses and feather cards are all so elegant. Your new set paired with Claire's Country Roses set is a match made in heaven! Lipstick on the pigs, that's just hilarious. Wonderful cards. Love the lips on the pigs on the first one.